Here is one of our most popular recipes: Millet Croquettes, from the October meal in our book. See photo on The Cookbook page of this website. Prep Notes: These patties are “the rave” at our dinners. Allow 1 hour for the millet to cool after cooking. These can be served immediately after pan-frying or keep warm in the oven. However, do not hold in oven longer than 1 hour as they will get too dry. Makes about 25 croquettes. 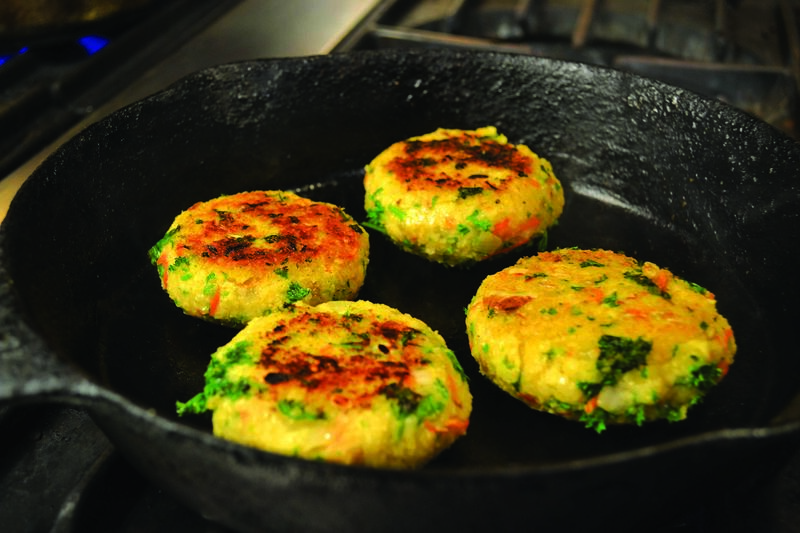 To make oil-free, after forming, place patties on a baking sheet and bake for 30 to 40 minutes at 350 degrees. 1. Rinse millet well, add water, salt and bring to a boil. 2. Reduce heat to low, cover and cook for 25 minutes. 3. Move the hot millet to a large bowl and stir in onions. 4. After cooling somewhat, add all other ingredients except parsley. 5. When cool enough to handle, mix well by squeezing the millet through your fingers. 6. Taste and adjust for salt, tamari, and vinegar. Mix in the parsley. 7. Place a small bowl of cold water nearby. This will make it easier to form patties. 8. Dip your hands briefly in the water and form fistfuls of mixture into patties, about 3 inches in diameter by ¾ to 1 inch thick. They will be easier to fry if the top and bottom surfaces are fairly flat. Prep Notes: This sauce is an exquisite addition to these scrumptious croquettes. 1. Dissolve miso and rice syrup into orange juice, using a fork or a whisk. 2. Bring to a boil; add arrowroot mixture and stir until it starts to thicken. Remove from heat. Allow to cool. 3. Serve about 1 tablespoon of sauce on each croquette.